Let's take a quick mid-Ascot break for a jaunt to Luxembourg, shall we? It's National Day over there, and the grand ducal family's been out for two days of festivities. On Friday, Grand Duke Henri and Grand Duchess Maria Teresa visited the town of Differdange while their oldest son, the Hereditary Grand Duke, and their daughter, Princess Alexandra, visited Esch-sur-Alzette. Friday night featured a torchlight procession and fireworks. 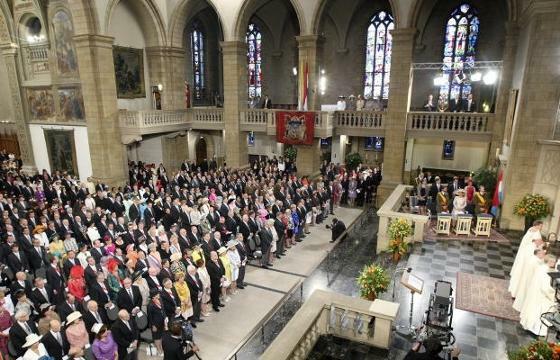 On Saturday, the family united for the Te Deum; later, the Grand Duke, Grand Duchess, and Hereditary Grand Duke were present at a military parade. And all along there were fashions and hats and uniforms, oh my! Oh, these two. More than thirty years of marriage, and they can still bring the awwws. Maria Teresa opted for a double dose of suits with waist ties: first, an orange accent, and in the evening, a metallic number. 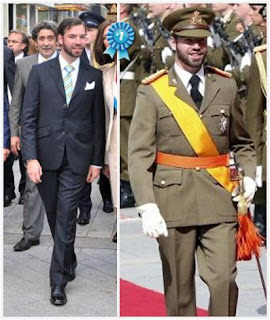 National Day is the official celebration of the Grand Duke's birthday (his actual birthday is April 16th), and he was looking dapper as ever in his uniform for the Te Deum and the military review and parade afterward. Apparently Guillaume's fiancé, Countess Stéphanie de Lannoy, the future Hereditary Grand Duchess of Luxembourg, is going to stay incognito for the time being since she's not officially a member of the family. Sad. Anyway, we did get a bit of a taste of what the wedding will bring as the Te Deum was held at the Notre-Dame Cathedral in Luxembourg City just as the wedding will be on October 20th. Alexandra can occasionally look like she's stolen her mother's clothes, which makes this girlish pink Carolina Herrera a refreshing change for this 21-year-old. And even though I missed Stéphanie, it was nice to see Alexandra accompany her brother on Friday. 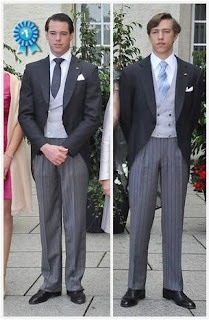 Rounding out the family on Saturday were two more sons of the Grand Duke and Grand Duchess, Prince Félix and Prince Louis (Tessy is Louis' wife). Missing in action was the youngest of the five grand ducal kids, Prince Sébastian, but I doubt he could have stolen this prize from the handsome Félix anyway. There is traditionally a gala on the evening of National Day complete with tiaras, though whether or not pictures are released is sketchy from year to year. Fingers crossed we'll see something later. Who's your sartorial favorite this National Day?